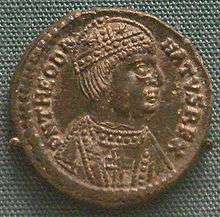 Another coin of Theodahad (534–536), minted in Rome. He wears the barbaric moustache. 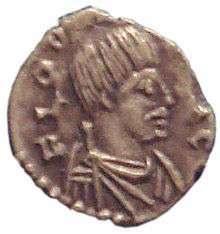 Theodahad (born c. 480 in Tauresium – died 536) was the King of the Ostrogoths from 534 to 536 and a nephew of Theodoric the Great through his sister Amalafrida. He might have arrived in Italy with Theodoric and was an elderly man at the time of his succession. Massimilliano Vitiello states the name "Theodahad" is a compound of 'people' and 'conflict'. 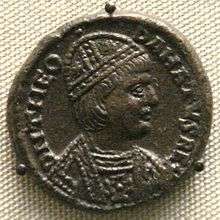 He arrested Amalaswintha, queen of the Ostrogoths from 526 to 534, and imprisoned her on an island in Lake Bolsena. Theodahad had at least two children with a woman named Gudeliva: Theodegisclus and Theodenantha. Thiudehad appears as a character in the time travel novel Lest Darkness Fall, by L. Sprague de Camp. ↑ Wolfgang Kuhoff (1996). 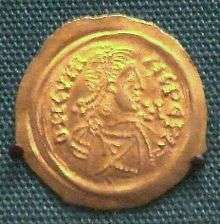 "Theodahadus, Flavius, König der Ostgoten 534-536". In Bautz, Traugott. Biographisch-Bibliographisches Kirchenlexikon (BBKL) (in German). 11. Herzberg: Bautz. cols. 824–832. ISBN 3-88309-064-6.